Every event in your home leaves behind energy debris. This is why people tend to say they can feel the tension in the air following an argument. Cleansing your home is an easy way to wipe the slate clean. There are several different cleansing methods, but one which many psychics recommend is the use of incense. Here's what you need to know. In addition to arguments, illness and death should both prompt a cleansing. You should also cleanse your home if a roommate moves out or if you acquire secondhand furniture. If you move into a new home, conducting a cleansing ritual should always be one of your first tasks. Divorce or the breakdown of a relationship can leave behind intense negative energy, so a cleansing partnered with a love tarot reading is in order. 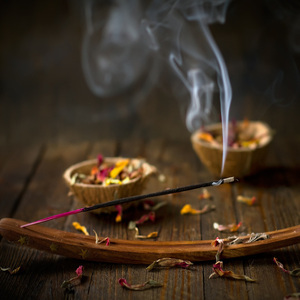 When you use incense to cleanse your home, you are essentially calling upon the help of astral forces and asking them to work their magic against a particular type of negative energy. This is why it’s important that you focus on why you want to cleanse your home. Conducting a cleansing ritual without purpose will likely result in lackluster results. Decluttering your home before you cleanse is an effective way to make sure you get the best results. Conducting a cleanse while there is an ongoing source of negative energy is rather like shovelling snow from your driveway while it is still snowing. Opening the windows offers negative energies a clear path from which they can leave your home. The incense you use to cleanse your home will depend on the type of energy you wish to remove. Rosemary and thyme are effective purifiers after an illness, while sage is an excellent choice when you move into a new home. Frankincense is ideal after the breakdown of a relationship, myrrh promotes peace and harmony, and sandalwood attracts luck and prosperity into a home. Since you can never really know other people's intentions, you should cleanse your home when you have the place to yourself. Starting in a ground floor room, place your incense in the center of the room. After you light it, sit quietly and meditate. Try to focus your attention on the task at hand. When the incense has burned away, move on to the next room. Starting a fire is not one of the best ways to dispel negative energies, so safety dictates that you cleanse one room at a time. It’s also important that you put any pets outside during the cleanse. This will stop them from disrupting events and protect them from the negative energies that will circle the environment before leaving your home. Cleansing your home using incense is an effective way to surround yourself with new, positive energy, but it’s important to remember that it’s not a strictly a one-off task. Your home will benefit from regular cleansing, so why not make it part of your routine going forward?